We are committed to you and your healthcare, and we strive to bring you the convenience that you deserve with our express service. 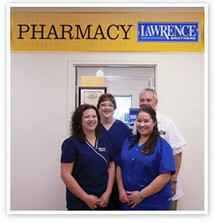 Our knowledgable, dedicated, friendly staff are ready to serve you. We accept all insurance cards, including Flexible Spending Accounts (FSA) and Health Savings Accounts (HSA). We have computerized record keeping. Free health screenings for diabetes, blood pressure, cholesterol, etc. (times & dates vary by location. Contact your pharmacy for details). Free AccuChek Blood Glucose Meters for all diabetic patients with their first new diabetic prescription. Visit ChooseMyPlate.gov to learn about the nutrients you eat, analyze your diet plan and get guidance on exercise tips.